In January 2013, Ed McNicholas, partner at Sidley Austin LLP’s Washington office, became chair of the Law Center’s Board of Directors, after serving for several years as member and vice-chair. Through an email interview, Mr. McNicholas tells us about what first attracted him to the Law Center, what he finds most meaningful about our work, and how he envisions the organization’s future. What first drew you to the Law Center? The passion and professionalism of Maria and the other attorneys at the Law Center was the initial attraction. The Law Center engages with senior policy makers and the highest courts in our country; it brings an incredible amount talent to that discussion, and it creates a space for homeless people to be part of the policy debate. No other organization is as systematic and effective in raising the voice of the homeless to the highest levels of the government, and doing it in a way that is effective in the Washington policy and appellate arena. Do you have an example of a part of the Law Center’s work that is particularly meaningful to you? One of my early experiences with the Law Center involved working on a Supreme Court amicus brief in a case impacting the right of homeless people to move from state to state and to enjoy the full benefits afforded to any other citizen of that state. What most impressed me about working with the Law Center was that the quality of appellate advocacy was as good as the more lauded DC appellate specialists, and it was driven by a great sense of purpose and care. As a new chair, tell us about your vision for the organization. Our country is a dialogue. Our constitutional morality – the march of American justice – has been defined by the bending of those legal structure that define the borders of our polity so that our dialogue is expanded to include more and more otherwise disfavored people. This has been a genius of the American project, continually engaging new voices and benefiting the entire community by their addition. I see the Law Center’s role as defeating those legal structures that exclude homeless people from our schools, our communities, our neighborhoods, and ultimately, our polity. The Law Center systematically works in the courts and in the government to convince others to move past fearful exclusion and appreciate that a respect for each of us demands that none of us lack basic shelter and subsistence. Ultimately, when we succeed in pushing back those barriers, we succeed in making America a better place to pass onto our children. 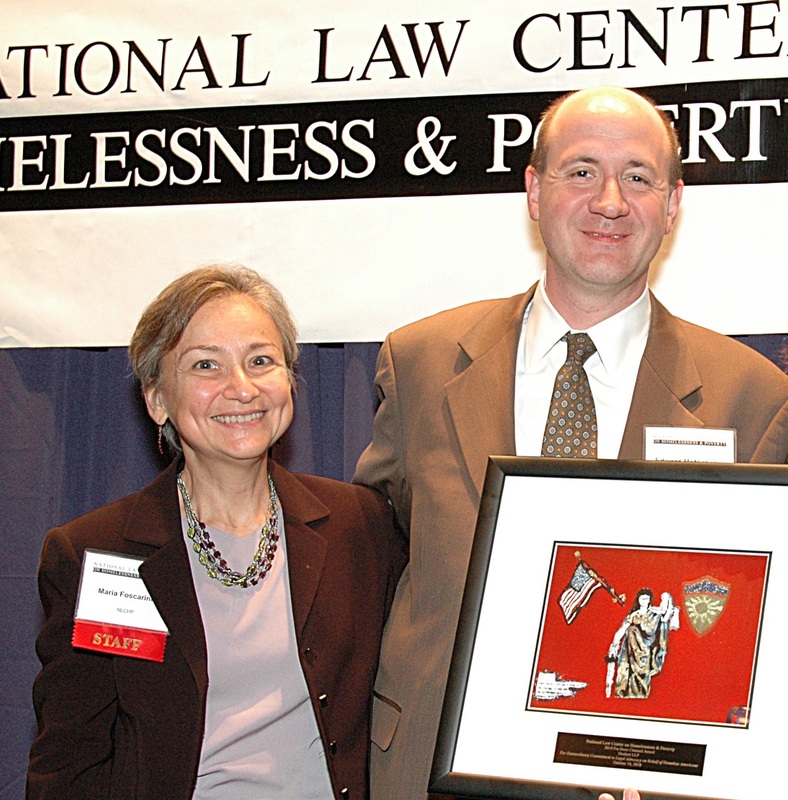 The Law Center provides the hands that help to bend the arc of history to this inclusion for homeless people. It is great privilege to be supporting such a talented and dedicated group of professionals. The attorneys at the Law Center are a continual source of inspiration. This entry was posted in Housing, Human Rights. Bookmark the permalink.